Prize Raffle: Tickets are $2 per entry and do not require race registration to purchase. To just buy raffle tickets, venmo the total amount with your name to @EllieHummel. 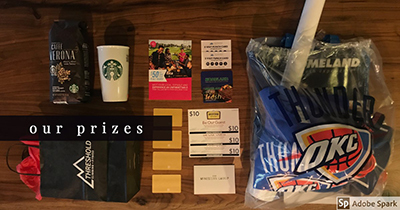 Enter to win: gift cards to Yokozuna, Homeland, Goro Ramen, McNellies, Bricktown Brewery, TopGolf, and Commonplace Books; class passes to Balance Yoga Barre, Summit, Threshold Climbing Gym, barre3, and Pure Barre; and goodies from Starbucks, Kamps, and the OKC Thunder. Designed by the University of Oklahoma Health Sciences Center Information Technology Department.